This post will only further convince you that I am really a twelve year old girl instead of a thirty year old professional. A few months ago, one of my co-workers who enjoys art as a hobby mentioned a fairly new phenomenon she was enjoying called adult coloring. No, these are not coloring books with “Mature” content (although a quick google search will let you know that these exist as well), but instead artists who are creating incredibly detailed line drawings full of patterns. I shelved this information in my “cool things for the future” brain pocket, and with a little extra spending money this month and extra time from all the rain, I figured I’d order a book and a new set of colored pencils. I picked up that beauty from Amazon, and eagerly awaited its shipment. Part of my coloring experiment was to see if I slept better at night with coloring before bed instead of playing on my iPad. The blue light from screens isn’t good for sleeping, and sometimes I think I stay up way later from YouTube and instagram binging than I would from something else. Yesterday the book arrived, and I immediately began looking for ponies. I was not disappointed. Besides ponies, the book had a ton of other animals. Some of my favorites were the dog, fox and big cats… but there’s something for everyone. There were only two pages that I pretty much hated and would never color. After flipping through the book, I settled on this guy. I may or may not have colored for almost three hours until my arm and elbow hurt. Art is painful folks! I had forgotten. In the end, I have this amazing rainbow pony which I’m super happy with. I also slept like a baby last night, so that’s a win. The book brags that coloring is stress relieving and relaxing. While I won’t make any scientific claims, I enjoyed this activity on a non-barn night while doing laundry. Beautiful! I think you must have a lot more patience than I do (and definitely more creativity! ), I think trying to color all those little spaces would stress me out! Has anyone seen this one. Secrete Gluon. 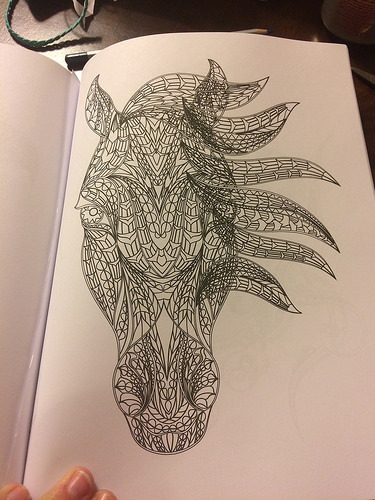 It is an adult coloring book that is really unique albete kinda surreal and strange like the art in Juxtapose Magazine. I’ve heard of this phenomenon, very cool! Also, I had to laugh at the “adult” coloring books – bet you’ll get some funny SEO hits out of this post! Those people are going to be super sad when they come here and find rainbow ponies! Um… you can’t just say something like “that I would never ever color” and not tell us what it is!!!!!! Speculating wildly…. I think it was an ugly lion and a ugly wolf? Go ahead and give the bottom of this list pictures a try. Nothing in ‘the rules’ (ha) says you have to keep them. Somewhere there is someone who likes that particular animal/critter. Your coloring skills are fab. Just post them as a giveaway on FB or maybe earn a few stash-bucks on ebay. In the meantime, enjoy the horses! I’ve noticed that I’m sleeping better lately … I wonder if its the needlepoint kit I purchased last week? Beautiful! I’m not sure I’d be able to stay in the lines. The second I saw this on instagram, I knew I was going to be hooked. Ordering it! I love your rainbow pony! That’s beautiful! I really enjoy sketching, might have to try this…. oh wow i love this! 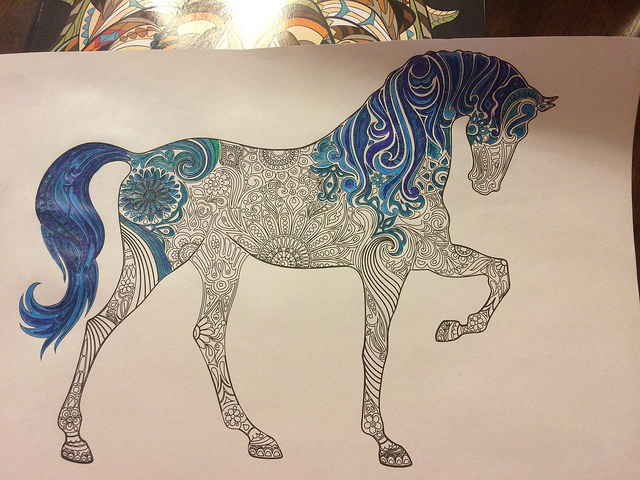 your rainbow pony turned out super well too…. must investigate further! This is how I started putting my horses onto canvas when I was painting my mind was “still” it wasn’t “racing” I noticed it right away, beats expensive therapy hahaha. That is really cool. Maybe you should just post all your completed pictures and I’ll enjoy them. 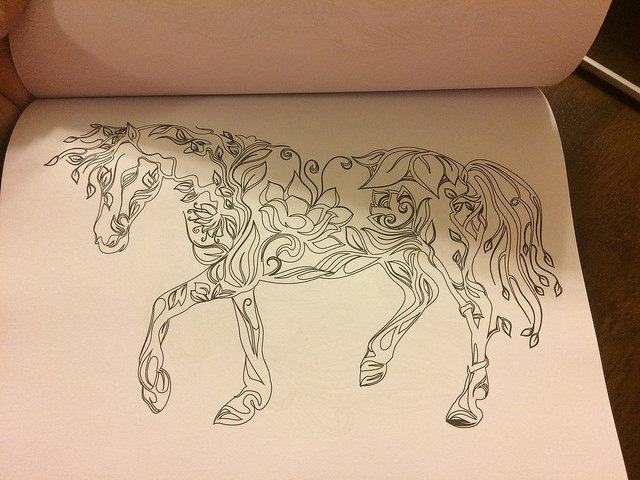 I am not sure I’m creative enough for that level of coloring book. Full disclosure: my senior year of college my friend and I brought coloring books and crayons with us to the library during finals week and we’d whip them out and just start coloring right then and there whenever we needed a 15 minute break from serious studying. I swear it was the most brilliant idea I ever had so I am not surprised to see that this is a thing! 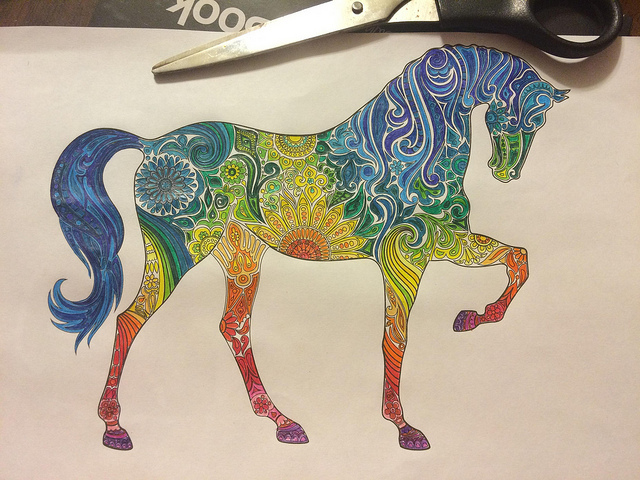 Your rainbow pony is AMAZING. I would frame that and put it on my wall. The rainbow pony is amazing! You are so talented! Just went to Amazon to add these to my wish list! I love the idea, probably much better for my stressed out brain than staring at my iPad! That’s cool! I love coloring intricate patterns like that. Coloring (in the lines) is good for your soul. True story, I just read a study on it. Also, my friends and I used to color Disney books all the time in college. It is so much fun, and definitely relaxing! I really want to buy the Secret Garden or Enchanted Forest one by Johanna Basford. Love your rainbow pony! I might have to get this book too! I totally just put the Enchanted Forest in my cart on Amazon. Hopefully it’ll ship eventually! Um, LOVE IT! Need it. It’s not “adult” but the images are really nice as they are various famous horse paintings throughout history. When I was a kid I had a book of patterns that was similar to this, but I like how these patterns are within an animal (or whatever). So pretty!! Just ordered mine! I NEED THIS!! Your rainbow pony is lovely! That looks fun. And addicting. I must get one. I think this would be so fun!! I want to bring one to work and de-stress between meetings. I love to color. Of course I have small children who ask me to color so I haven’t felt the need for an “adult” coloring book yet. You might be interested in the type of art I’m working on. http://4rranch.blogspot.com/2015/05/wangler-painting-horse.html I’ve been teaching my horse to paint. He has his own facebook page too. https://www.facebook.com/pages/Wrangler-Can-Paint/1564066673842790 I always enjoy reading your blog and surprisingly found another local blogger that had commented on something. I recognized the location of her picture. Had to go to Texas to find a neighbor in Virginia, small world. amazing! it reminds me of the recent activity i did, painting ceramics! it’s incredibly stress relieving too! I just bought a copy of this for myself and my best friend in California. I LOVE the idea of doing this before bed!!!! Outstanding, thank you! I love coloring! It’s one of my favorite activities with the two year old I babysit haha. I have no control. 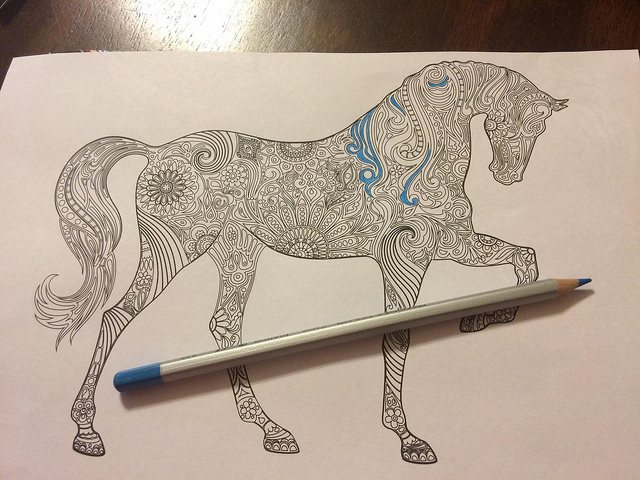 I’d color in the lines for a solid two minutes and then go ham like a 5 year old. love horse art. 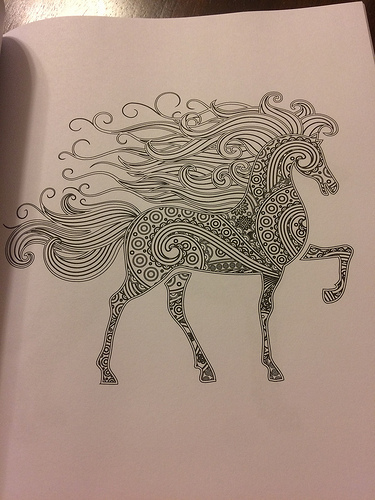 Those coloring pages are amazing!